Wrestlers from around the country—and across the ditch—will descend on Morrinsville this weekend with the hope of leaving as the new PWE Champion. Professional Wrestling Entertainment (PWE) holds its first event, Uprising, at the Morrinsville Senior Citizens’ Hall this Saturday, August 15. A series of five qualifying matches (three singles bouts, a triple threat, and a tag team contest) will determine who advances to a six-man over-the-top-rope battle royal, the winner of which will become the first-ever PWE Champion. “When Kerry ‘Tank’ Diamond and I sat down and talked about putting this show together, we talked about what we needed to do to put on a great show for the fans, and that was to showcase the great wrestling talent that New Zealand has to offer but also what great wrestling talent is only just over the ditch in Oz,” PWE Owner Tom Ley told NZPWI. Uprising features a stacked card with wrestlers from Auckland (Aaron Henry, James Shaw, Johnny Idol and Travis Banks), Tauranga (Bull Addams and Stix), Morrinsville (Tank), Wellington (“Rufguts” Roddy Gunn) and Christchurch (Hustla, Reece Breeg and T-Cole) as well as two Australian competitors (Cass Stone and Mark Kage) representing PCW in Melbourne. If everything goes well this weekend, PWE plans to continue holding events in Morrinsville and also expand into the Northland region where the promotion was founded, Ley said. 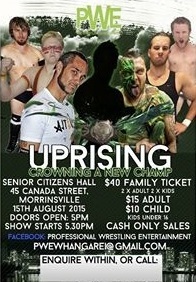 PWE Uprising takes place this Saturday, August 15, at the Senior Citizens’ Hall in Morrinsville. The card, subject to change, is listed below.